Sometimes it’s the bread basket that holds the most favored part of the meal! 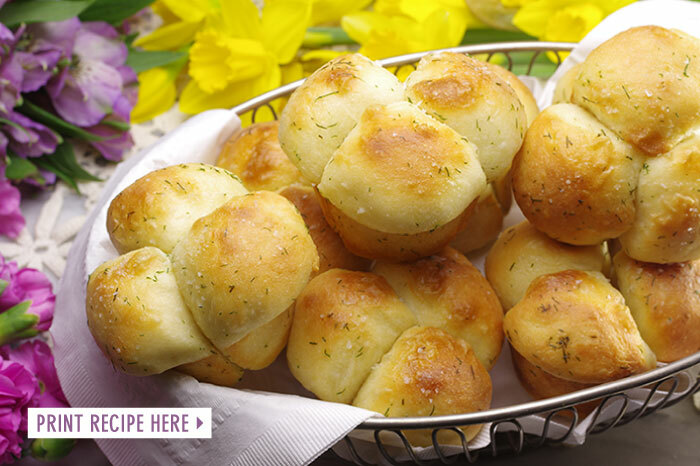 These rolls may just steal the show and overshadow the other dishes on the table. An easy, no-knead dough is assembled up to two days ahead of time and baked at the last minute for ultimate freshness. The golden tops are brushed with butter infused with fresh dill. 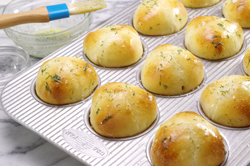 There will be no leftovers of these delicious rolls! 1. 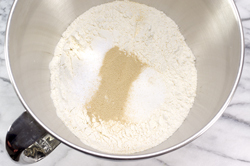 In the bowl of a stand mixer outfitted with the paddle (or a large bowl), stir the dry ingredients (flour, salt, sugar, and yeast) together until evenly distributed. 2. Whisk the egg and combine with the cooled melted butter. 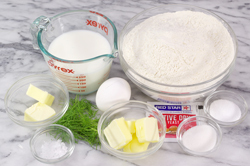 With the mixer running, add the egg-butter mixture to the flour followed by the milk and lukewarm water. Mix on low until combined. 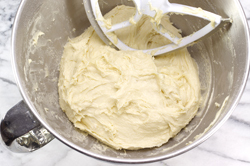 Change to the dough hook, and knead the dough on low speed for 4 minutes. 2. 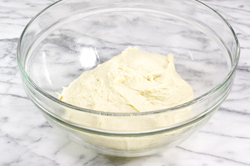 Transfer the dough to a large bowl lightly greased with a little olive oil. Turn the dough ball so that all sides become oiled. Cover with plastic wrap and allow the dough to rise at room temperature until doubled, about 1.5 – 2 hours. Punch the dough down, reform into a ball, and return to the bowl. Cover to create an airtight environment and place in the refrigerator for at least 4 hours, or up to 2 days. The dough will be easier to handle when chilled. 3. 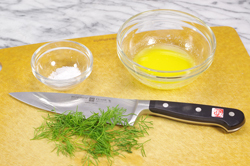 When ready to enjoy, Melt the butter and add the minced dill. 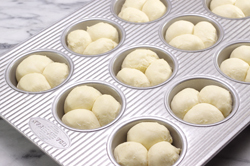 Lightly grease a muffin pan, or use a nonstick muffin pan. Cut the dough into 36 even pieces. Form each piece into a small ball. Dip into the melted butter, and place 3 pieces into each well. Allow the rolls to rise until doubled about 45 – 60 minutes depending on the room temperature. 4. Bake at 375°F for 15-20 minutes or until the tops are lightly golden brown. Brush the tops with the remaining melted butter and dill mixture. Sprinkle the coarse sea salt on top. Serve immediately while piping hot!